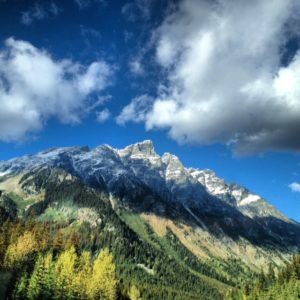 Whether you are suffering from or experiencing the stages of professional burnout or whether you are overly empathetic and feel you are fatiguing and burning out from your continual role as a healthcare provider or other professional who cares for people on a daily basis, this 2 day course in the beautiful Canadian rocky mountains is for you. Shelly is a physical therapist and yoga therapist that is dedicated to educating, inspiring and empowering people to create and sustain overall health and well-being, including those living with pain and recovering from injury AND those who care for them. Shelly has over 21 years of experience in the integration of yoga into healthcare and offers continuing education courses and speaks at medical, wellness and yoga therapy conferences worldwide. This course is designed to be informative, inspiring and educational as well as offer you tools and direct experience with self-care activities informed by yoga practices and philosophies. Many of the practices and information can be integrated immediately into the clinical setting and into your own home self-practice. This course is highly sought after and one of Shelly’s most popular and requested courses. There are only 16 spaces and this course will likely sell out. Define burnout (BO) and empathic distress (ED), particularly as it relates to the health care practitioner. Outline 2 models of burnout including risk factors, warning signs, stages and characteristics. Compare compassion satisfaction vs ‘compassion fatigue’ or empathic distress. Discuss the ways in which practicing yoga may help prevent and manage symptoms of BO and ED and help promote longevity and vitality in work-life balance. Includes defining yoga, outlining 8 limbs of yoga, and using a pancha maya kosha approach. Discuss how we can continue to provide compassionate and empathetic care for our patients, at the same time reducing risk of BO + ED by using yoga methods and philosophy. Briefly discuss how integrating a yoga approach into your current patient treatments may help improve compassion satisfaction and empathy, optimize quality of care for our clients, and help prevent BO + ED. Learn a variety of immediate techniques and practical tips to integrate into your daily routine at your workplace and at home. A list of resources is included. Participate in experiential yoga practices that include meditation and mindfulness techniques, pranayama (breath practices), asana (physical poses), and other movement integrated with yoga philosophy to address components of self care that can help inspire you on your path to restore balance, vitality, peace, and reconnection to your authentic self and purpose. 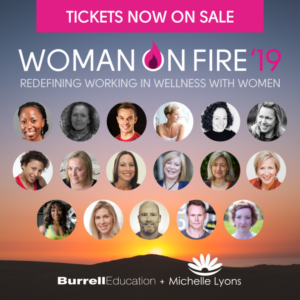 I’m thrilled to announce I will be one of the presenters at the 2019 Woman on Fire: Redefining Working in Wellness with Women in Brighton, UK! Jenny Burrell and Michelle Lyons have spear-headed this incredible conference dedicated to delivering quality continuing education in an inspiring, empowering and FUN way. Something that is well aligned with my own mission to do the same. I will be presenting 2 sessions: A lecture-type presentation on Cultivating Compassion in Therapy and a practical session on Enhancing Pelvic Floor Health Through Yoga. Cultivating Compassion in Therapy is more than just feeling compassion for our patients and clients. It involves gaining a more in-depth understanding and insight into the needs of our clients and ourselves and choosing responses that serve both the client and us within the context of the situation. It also includes helping our clients and ourselves cultivate self-compassion. Some compassion science researchers suggest this compassion can be trained. Join me for this 1 hour presentation about the science surrounding compassion, the debate around compassion fatigue, empathy vs compassion, benefits of providing compassionate care both for our clients and ourselves, and ways we can train compassion without burnout. Join me for 1.5 hour practical session on Enhancing Pelvic Floor Health Through Yoga. Be prepared to participate and enjoy inspiring, empowering and educational gentle yoga practices implementing a variety of techniques that you can immediately use for yourself and with your clients, including pelvic floor (PF) awareness practices, visualization, mindfulness meditation, breathing practices and mindful movement to help promote PF relaxation, engagement and excursion. Explore and experience how PF health is not just about kegels or mula bandha! Examples of how yoga philosophy can inform language used to potentially enhance PF cueing and create safe therapeutic environments will be included. In addition to learning, you get to enjoy the added benefit of some well deserved self-care as you participate in these practices, and experience what it feels like to nourish all aspects of your being, using a biopsychosocial model of health. The 2019 San Diego Pain Summit (SDPS) continues to provide relevant clinical education and current pain research delivered by expert clinicians and research scientists surrounding the topic of pain. The keynote for the 2019 SDPS is Dr. Antonio Damasio. Numerous national health surveys and reports conclude that compassion is lacking in healthcare and many would even argue there is a growing compassion deficit in some parts of the world. As healthcare providers, it is assumed we will provide compassionate care to those we serve, as it is inherently part of our job. However, research shows that the capacity to provide compassionate care can vary and depend on a wide variety of factors. There may be challenges we face that may influence and even inhibit our ability to offer compassion to people in pain. In this session, I will provide a working definition of compassion, differentiate between empathy and compassion, discuss the debate surrounding the ‘myth of compassion fatigue’, summarize the research surrounding the benefits of providing and receiving compassion (including self-compassion) for those living with persistent pain and also for the healthcare providers, and describe accessible and practical ways that yoga can be used to train and cultivate more compassionate (and self-compassionate) responses. The five tenets of Compassionate Pain Care (CPC) will be introduced.